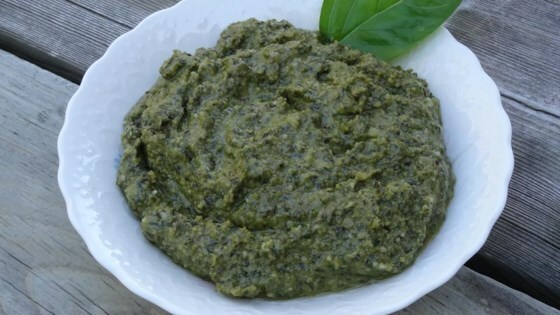 "A fresh-tasting pesto that can easily be used alone on pasta, crostini, pizza; or add some to your favorite spaghetti sauce for a delicious special flavor! Use pine nuts, walnuts, or a combination of both." Place basil, Italian parsley, and garlic into a food processor, pulse several times to combine, and process until basil is finely chopped, about 30 seconds. Add pine nuts to basil mixture; process until finely chopped, 30 more seconds. Process Parmigiano-Reggiano cheese into mixture until finely ground. Mix lemon juice into mixture with the machine running; slowly drizzle olive oil into pesto in the running machine until incorporated and pesto is thoroughly combined. Turn off machine and season pesto to taste with salt and black pepper. See Chef John's technique for a real, fresh basil pesto! Pesto will keep well in the refrigerator for a week or a little longer. Freeze small portions in small airtight containers and they will be handy to throw in soups or sauces, etc. Followed the recipe exactly. Just didn't like it. Instead of Pine nuts (way expensive) I have used almonds, pecans,even pistachios. Put a bit more oil on top before freezing and yumm- o! I had heard if you blanch the basil it will remain a bright green. I'd. And it did. Delicious.